Jasmine oil is extracted from the petals of the Jasminum officinale, semi-green deciduous shrub. 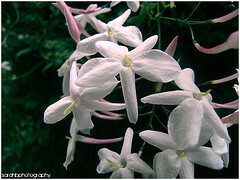 This common jasmine grows 20 - 30 feet in height and spreads 7 - 15 feet. It blooms white to pale pink, star shaped, flowers from Spring until Fall, (May - Sept.), then rests in the Winter months, (Oct. - March). It's ideal for growing on trellises or arbors in sun or partial shade. It loves warm climates, requires high humidity and plenty of light to flower. It loses its green leaves, particularly, in cold Winter months. Jasmine flowers release their perfume at dusk so they are gathered at night to preserve their powerful scent. Next, they're placed on, olive oil soaked, cotton cloths for several days then extracted. There are four methods of extraction: steam distillation, maceration, cold processing and solvent. Jasmine oil extracted by steam distillation or cold processing is considered better than by solvent extraction. During solvent extraction, a residue can be left causing skin allergies. Jasmine grandiflorum is closely related to Jasmine officinale. JASMINE ESSENTIAL OIL AT AMAZON! Jasmine oil is deep mahogany brown with a golden tinge. It has a rich, exotic, sweet, floral, scent. It's non-toxic, non-irritating and generally non-sensitizing. It's expensive due to its costly and labor intensive process. It takes huge quantities of petals, from the Jasmine flower, to produce one ounce of oil. Because of the quantity of petals needed to make the oil, it's rare and highly sought after. It's one of the most expensive oils in use. Steam distilled Jasmine is, especially, expensive. CAUTION! Jasmine oil should not be used by pregnant women, due to its emmenagogue properties. CAUTION! May cause allergic reactions. If so, discontinue use immediately. Contact your health care provider, if needed. Jasmine is used in skin and hair care formulations: soaps, lotions, bath oils, shampoo, creams and perfumes. It blends well with other oils including: Bergamot, Clary Sage, Clove, Ginger, Grapefruit, Lemon, Mandarin, Neroli, Orange, Palmarosa, Patchouli, Rose, Yiang Yiang, Sandalwood and Vetiver. Pure Jasmine oil can be very expensive. ATTENTION! Understand the cautions of using ANY essential oils. Essential oils contain bioactive ingredients. This means they contain natural chemicals that interact with our biological systems. They're potent chemicals and should be used with care. Never use large amounts of essential oils externally or internally. Never use them straight. Always dilute in a carrier oil, or soap, lotion, or other buffering agent. Never use them without knowing what their bioactive compounds are known to do. When making homemade soap, a tiny amount of Jasmine oil goes a long way for an exotic, sweet, fragrance. Follow your homemade soap recipes, closely. Never substitute oils. Use exact amount of oil specified in the soap recipe. Test fragrances or additives. Purchase essential oils from reputable vendors. Keep good reference notes. Cut costs! Use a Jasmine blend to make a small batch of soap, for a special occasion or holiday. It can often be purchased diluted in a carrier oil for a more reasonable price. An exotic, sweet, smelling homemade soap would be perfect for Valentine's Day! Add an extra flair by using heart shape soap making molds. These soap molds are popular anytime. Use Jasmine for making homemade shampoo. Soothe dry itchy scalp conditions. Tame frizzy and unruly hair. Add softness, moisture and shine with a sweet fragrance. Learn how to make soap with a specialty or soap making oil, for you!